ORLANDO, Fla. – Do the rules of the road apply to drivers if you aren’t really driving? Local realtor Daniel Wilson reached out to me and had some safety questions, along with some concerns about his daily driving commute. Wilson drives to work every day, kind of. In today’s society, it’s not just cut and dried anymore when it comes to how the rules apply, especially when some drivers are not in complete control of the vehicle. 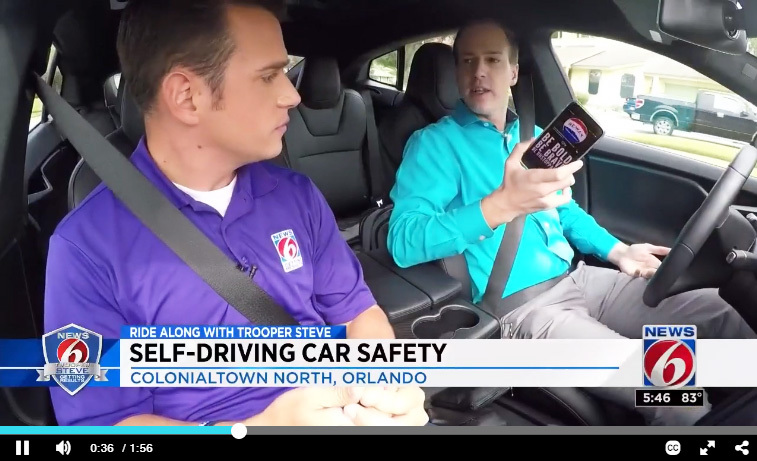 Wilson owns a Tesla and has noticed that other “self-driving” car owners negate some important safety practices. Wilson had one important question: Is texting and driving legal in a self-driving vehicle when the car has the control? It may be 2018 and things are starting to look like the “Jetsons,” but the traffic laws apply to all motor vehicles on the road, self-driving or not. As a driver, you are responsible for the safe operation of the car, and texting while in the driver’s seat is still considered illegal and could result in a hefty ticket. After clearing that up, Wilson shared some things he’s come to learn while owning his new ride. First and foremost, Wilson was adamant about wearing his seat belt. Just because the car may be able to drive itself doesn’t mean it’s going to put the seat belt on for you. Making sure you’re aware of your surroundings is another big tip, Wilson said. Being constantly aware of your surroundings will keep you ready to for whatever hazards may present themselves and allow you to be aware when approaching stop signs and red lights.